That cool breeze you feel isn’t the first sign of fall – it’s a collective sigh of resignation from controllers across America. Budgeting and planning season has begun again. 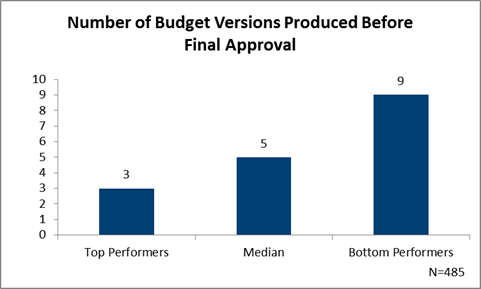 Curious how many budget iterations companies generate before approving a final, enterprise-wide budget? So were we at APQC, the nonprofit business benchmarking and research firm I work for. So we dug into our Open Standards Research database and pulled out metrics from companies (of all sizes). What practices help to streamline the budgeting process? Forecasting guru Steve Player of The Player Group told me that “companies [should] eliminate the budget process entirely.” To be sure, he recognizes that some finance staff may not yet be able to do that. “But for whatever political reason you cannot get rid of it, then you should minimize the damage by shrinking the process down to one or two budget iterations. And that starts with senior management telling the business units what is expected and why. The unit heads are better off focusing plans on the big rocks — the key drivers — instead of the minute details at the chart-of-accounts level. The key drivers tell you what you’re capable of.” Player also suggests compressing the budget process from multiple months in duration down to one month or less. It’s also important that the senior executive team establishes stretch goals for revenue and earnings that are within reason. Selecting a “finger in the wind” multiplier for year-over-year growth can backfire. Say, for example, that the gum division of a large food and snacks company achieved $50 million in revenue and generated 5% profit (before interest and tax) in 2014 and is on track for $70 million in revenue and a 6% profit in 2015. In that case, it may be tempting for leadership to throw down a 2016 revenue target of $100 million with a lock-step bump in expected profit. But, really, how doable is that? To achieve this tough, new goal, the leaders of the gum division may be forced to venture ill-equipped into new terrain. They know that they can’t just sell more gum without doing something differently. So perhaps they might start eyeing overseas expansion and/or new marketing or packaging campaigns. At the height of budget season, with the pressure on, it may be tempting for unit managers to skip the steps necessary to assess in a systematic way potential strategic risks that, if they materialized, would send the gum business way off track. Any target selected should be explicit about what is expected in the overall operating environment. Another factor is the budgeting process itself. The most efficient companies ensure that every division, everywhere in the world, uses the same definitions and budget categories as the parent company. Many use pre-populated spreadsheets or cloud-based budgeting tools. Such standardization allows the controller to easily and accurately roll up multiple budgets into projected financial statements that align with financial reporting requirements for investors and auditors. Mary Driscoll is a senior research fellow for financial management at APQC, a nonprofit business benchmarking and research firm based in Houston. Focusing on Key Business Drivers is important, I agree. That said, I also believe that “god is in the details”. Bottom line, I totally connect to the last paragraph, emphasizing “sound practices” and efficient internal processes. In my opinion, if you have effective and efficient internal processes (and a good budgeting tool, usually) you can start your budget from the detailed trial balance level and still have it done with 2-3 iterations without dragging it for months.